Picture a team of six people hauling on ropes — pulling a 40,000-pound fire truck along City Hall Place. "This is a first-time event for the Plattsburgh area," City of Plattsburgh Promotions and Special Events Coordinator Sandra Geddes said at a press conference on Wednesday. The fire-truck pull, featuring the Plattsburgh City Fire Department's reserve engine, is part of the lineup for the 39th-annual Mayor's Cup Festival and Regatta, set for July 8, 9 and 10. 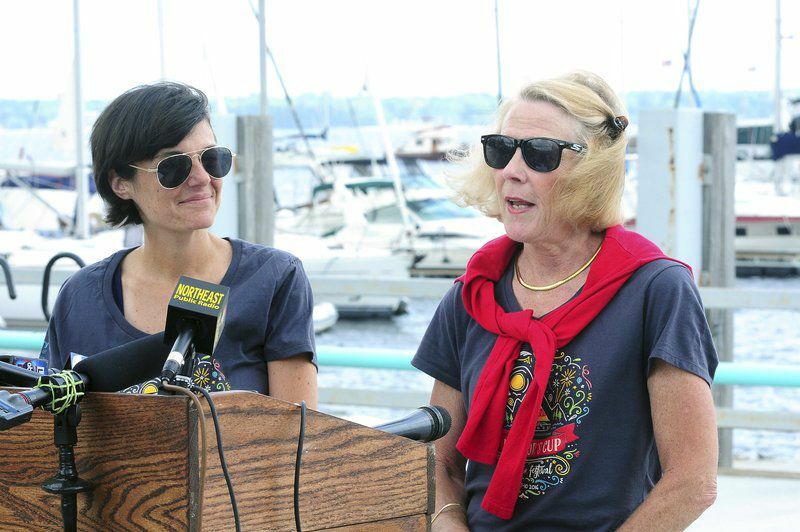 But of course, organizer Joanne Dahlen said at Plattsburgh City Marina, "the regatta is the signature event. "It’s the largest sailing event on Lake Champlain, in any part of the lake." The Mayor's Cup Regatta features three divisions of sailboats — racing, cruising and multi-haul — and attracts sailors from all over New England and Canada, she added. "It just makes it all the more interesting to watch and exciting for our community to be hosting a regatta of this magnitude." One new addition to the festivities, Geddes said, is the Adirondack Coast Collection. "This is all the local bands that are going to be performing for the Mayor's Cup this year," she said. The lineup starts at the weekly Downtown Rising on Friday, July 8, in Trinity Park with DJ Adam Defayette, followed that night by Plowman’s Lunch, the Wagar Bros. and incaHOOTS. On Saturday, July 9, Funky Bats and All Without the Bass continue the collection. "They have quite a following — (they are) very popular, wonderful musicians," Geddes said. "We're very excited about the local talent that we have participating this year." Also new to the festival, a yoga session led by Lynda Garrand of Trinity Yoga will take place from 8 to 9 that Saturday morning at Trinity Park, Geddes said. And The Rick Alviti Show...Elvis! will perform at the Rotary Club Bandshell at 7:30 that night. A popular event from last year, the USA Luge Slider Search, will make another appearance. "They start at upper Bridge Street go to all the way down Bridge Street," Geddes said. Kids can ride the luge for free from 5 to 6:30 and then from 7 to 8:30 Saturday night, as USA Luge looks for young talent to train. Geddes said they should register on the Team USA website to help give a head count. "And then after 8:30, grownups get to do it, too." Downtown Rising on Mayor's Cup weekend will feature extended hours, going from 2 to 7 p.m., organizer Simon Conroy said. "We have really good music lined up," he said. "We have the usual produce and meats and food trucks, and it's just a great spot where everyone comes together." On top of that, horse-drawn trolley rides will take off from Trinity Park, going down to the waterfront. "You can hop off in between or here (on the waterfront), they'll have a few stops, and then you can also ride back up to the city. "So it’s going to be a way to connect the center of the historic downtown to the waterfront." Brittany Trybendis, director of North Country Thrive, said her organization will host a Get Ready to Learn event at Trinity Park on Mayor's Cup Saturday. The event raises awareness for school readiness, learning and reading, she said. North Country Thrive will provide thousands of books to families participating in the event along with several kids activities and information from organizations that provide services to children. "(It's) great information for school readiness to get students thinking about what they need when they enter school." Mallory Valk, artistic programming director at Strand Center for the Arts, said she and Center Gallery/Museum Director David Monette have coordinated with artists to paint murals on windows of downtown businesses. "There’s sailboats and suns and everything summer. "At the Strand our goal is to have the community be involved in the arts and bring arts to the community and make it accessible," she continued. "We just wanted to help beautify downtown Plattsburgh and help people recognize the businesses that support the arts and support the Mayor’s Cup and make it a fun summer." The Advocacy and Resource Center of Clinton County will once again sponsor the Kids Zone that weekend. "We've been participating in Mayor's Cup for about four years now with a variety of games and craft activities for kids," organizer Michael Clausen said. "We're happy to do it again this year. We're all about family fun." Michelle Senecal, events and special projects manager at the Foundation of Champlain Valley Physicians Hospital, said this year's bike ride on Mayor's Cup Sunday will feature a 30-mile route and a 62-mile option. "This event is important to us in the foundation office because funds raised from it go to our travel funds, which is local families traveling out of the area for care not provided at CVPH." Richard Jarrette, organizer of the Boat Parade of Lights, said WIRY will broadcast from the City Marina for the audience, beyond the judges and out onto the water. This year, that popular event is set for 9 p.m. Thursday, July 7. "Boaters and skippers are really going to get a chance to explore their wild and creative sides, not worrying about the mechanics of making sure their sound gets out there," he said. "So the audience is really going to feel the music from behind them, and the boaters are going to hear that and respond. "And it will be a great interplay between them."